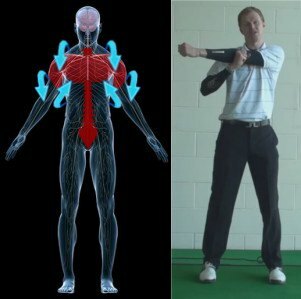 If you've ever tried to hit a golf ball or play a round of golf without warming up first then you know the frustrations and problems that can arise from this lack of Golf Exercises and preparation. Although golf is not an extremely active sport, it does still involve an athletic motion using an array of muscles and joints that don’t tend to perform their best when taken out of their state of inactivity. If you've ever played a round of golf without warming up first then you probably remember that it took you a few swings and holes to feel like you were able to get anything going. People are living increasingly inactive lives so it makes sense that our bodies need some Golf Exercises and conditioning to help prepare us for physical activity. One common goal for just about any player you'll encounter is the desire to hit the golf ball as far as possible. To reach your full potential in distance requires a lot of flexibility. The golf swing relies heavily on the torque you create in the winding and unwinding of your upper body against your lower body. Not warming up these essential areas of the body is going to make a full shoulder turn very difficult and can potentially leave you prone to injuries. As we get older, our flexibility declines slowly but with proper stretching and exercising, we are able to get the most out of our capabilities. Since the body doesn't go directly from its sedentary state to one in which it’s ready for physical activity, it's important to stretch and warm up gradually. This process is to get the blood flowing more actively throughout the body so that it can perform effectively. In this video section you will find some helpful golf exercises and tips on how to stretch and prepare your body for success on the golf course. A proper warm up doesn't take a lot of time so if you take this game seriously and want to consistently play your best then don't skip this important step. Over the last 15 or 20 years, golf has undergone a fitness revolution. Once thought to be a game that could be played by anyone in any physical conditions, serious golfers have more and more turned to fitness as a method of improving performance. Besides the obvious benefit of getting fit for your day to day life, improved fitness can help your golf game in a number of ways. Those improvements include higher swing speeds, better balance, increased strength through the hitting area, and more. If you are serious about becoming the best golfer you can be, getting in shape should be high on your list. Working on your fitness specifically to play better golf is something that you need to do carefully, with plenty of planning. Not all exercise is beneficial to golf, so keep your long-term goals in mind when designing a workout regime that will lead you where you want to go. Of course, you should always check with your doctor before taking on a new workout routine, and find help from a professional trainer if you are unsure how to complete certain exercises. Following are a few key points to keep in mind when aiming to improve your overall golf fitness. •	Bulk is not helpful. Simply adding sheer size to your muscles is not likely to benefit your golf game. While it helps to be strong, muscles that are too big can get in the way of proper swing mechanics. It is important to strike a healthy balance between muscle mass and body shape to ensure that you don’t place limitations on your golf swing based on your size. •	Flexibility is king. If there is one single part of your fitness that is most important to golf, it is flexibility. Golf is a rotational game, and great flexibility is required to maximize your rotation – and your club head speed. Take your lead from the golfers you see competing on the PGA Tour. Instead of having bulky muscles, the top pros and lean and flexible. Many of them are in tremendous shape, but they have focused on building a slender physique rather than adding weight to their frame. •	Quick, sudden movement. Golf requires the player to make quick, sudden movements in the swing. As you are training, keep that in mind, and tailor your workouts to that demand. The ability to slowly push a large amount of weight, for example, is not something likely to benefit you on the golf course. Pursuing a higher level of personal fitness in order to improve your golf game is certainly something worth your time and effort. While you are focused on making your game better, you will simultaneously be doing something that is good for your life as a whole. Before getting started, make a list of your fitness goals and make sure they are in line with your goals on the golf course. Train in a golf-specific manner, and the results should quickly show themselves. 1. How important is pre game stretching to your performance?